Tyco Fire Protection Products, makers of the leading global brand ANSUL®, announced the launch of its factory-installed fire suppression system program with Caterpillar, the world’s leading manufacturer of construction and mining equipment, diesel and natural gas engines, industrial gas turbines and diesel-electric locomotives. The program will provide factory-installed fire suppression systems on several models of Cat® mining equipment, with the ultimate aim of enhancing vehicle integrity and longevity as well as expediting machine delivery. 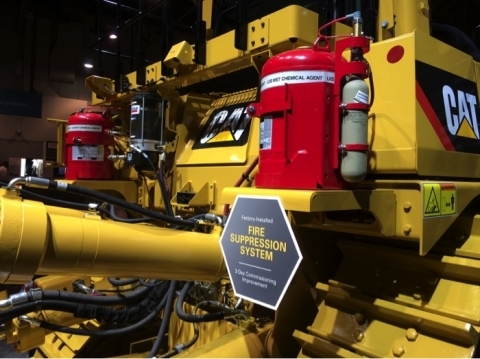 The factory-installed fire suppression system program resulted from Caterpillar Voice of Customer surveys that revealed end users’ need to address after-market design and installation practices. Caterpillar conducted a worldwide evaluation of vehicle system manufacturers and their fire suppression technologies in order to standardize these systems for their vehicles. From this evaluation, Tyco Fire Protection Products and its ANSUL brand fire protection systems were chosen due to the global network of Authorized ANSUL Distributors, innovative fire protection technologies, and world-class global account support and technical expertise. Caterpillar introduced its vehicles with factory-installed fire suppression systems at MINExpo International 2016 in Las Vegas Sept. 26-28. To learn more about ANSUL brand products, visit www.ansul.com. Tyco Fire Protection Products is a division of Tyco, the world's largest pure-play fire protection and security company. As an industry leader, Tyco Fire Protection Products uses its global scale and deep expertise to drive innovation, advance safety and solve the unique challenges of customers in more than 190 countries worldwide. Every day, Tyco Fire Protection Products manufactures and delivers an unmatched range of detection and suppression systems, extinguishing agents, sprinkler systems, valves, piping products, fittings, fire-fighting equipment and services that helps its customers save lives and protect property. Its global technology portfolio includes fire suppression, fire detection and mechanical building product offerings sold under many of the world's best-known brands: ANSUL, CHEMGUARD, EZCARE, FIRECLASS, FLAMEVISION, GRINNELL, HYGOOD, NEURUPPIN, PYRO-CHEM, RAPID RESPONSE, SABOFOAM, SHURJOINT, SIMPLEX, SKUM, SPRINKCAD, THORN SECURITY, VIGILANT, WILLIAMS FIRE & HAZARD CONTROL, and ZETTLER. For more information, visit www.tycofsbp.com. ANSUL® is the premium fire suppression product brand of Tyco International (U.S.), Ltd. The full line of ANSUL special hazard fire protection products includes fire extinguishers and hand line units; pre-engineered restaurant, vehicles, and industrial systems; sophisticated fire detection/suppression systems and a complete line of dry chemical, foam, and gaseous extinguishing agents. ANSUL products are developed and tested at the ANSUL Fire Technology Center, one of the most extensive fire research and testing facilities in the world. ANSUL products meet the demanding challenge of industry and commerce, including high hazard/high risk markets such as automotive, aviation, mining, chemical and petro-chemical, utility, fire service, and metal manufacturing/processing industries. For more information, visit www.ansul.com.